Staged in Linz, at the 2005 World Junior Championships, one young man from the host nation attracted attention as being a player with a special talent, a name to note. Now 13 years later, on Tuesday 6th November, in the same city, Stefan Fegerl emerged the only player from the home country to succeed in the second preliminary round of the Men’s Singles event, in the qualification tournament for places in the Seamaster 2018 ITTF World Tour Platinum Liebherr Austrian Open. Now 30 years old, to some extent the potential as a teenager was realized, he accounted for Chinese Taipei’s Peng Wang-Wei (11-1, 9-11, 11-8, 11-3, 11-6) to keep main draw hopes alive. 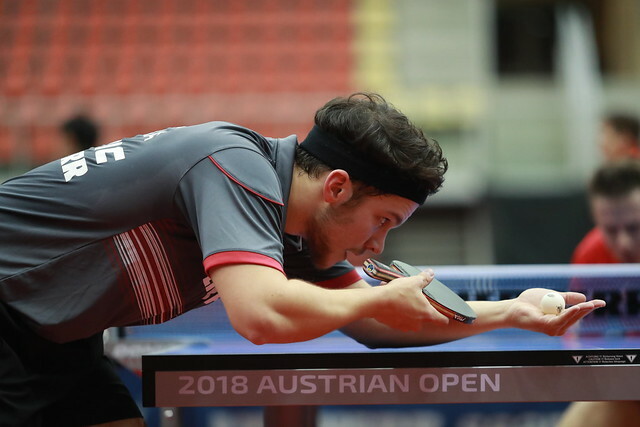 One success for Austria in the second preliminary round of the Men’s Singles event, it was the same number for Latin America. Gustavo Tsuboi beat Denmark’s Anders Lind (11-13, 11-7, 5-11, 11-5, 10-12, 11-6, 11-6) to emerge the continent’s only winner.